So finally an agreement has been reached between the political parties and the broadcasters on how the televised “debates” will be operated. I put the word in speech marks on purpose. What has been agreed is a mish-mash of offerings that will possibly leave the electorate rather frustrated. On the other hand, they will definitely get the chance to see the respective leaders enough times to get a good idea of what they have to offer. It starts on Thursday (26th March), with a live question and answer programme on Sky News and Channel 4, where David Cameron and Ed Miliband will face questions from a live studio audience, in a programme presented by Jeremy Paxman and Kay Burley. They will not be facing those questions together, and I imagine the person that goes second will have a massive advantage (so it will be interesting to see how they deal with that). Miliband has pointed out that this doesn’t involve a head to head debate between he and Cameron, which is a shame, but Cameron was simply not willing to do that, so this is the next best thing. 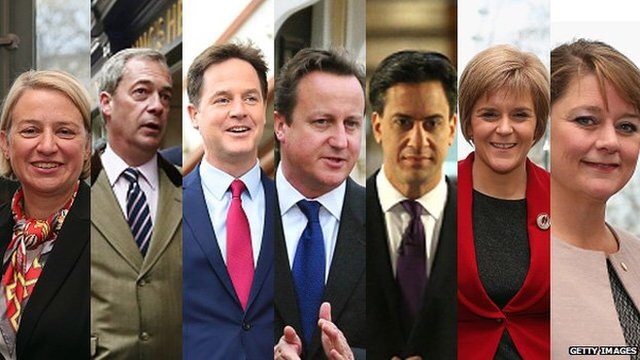 Next, on Thursday April 2nd is the one time all the seven leaders will actually debate with each other. The programme on ITV, to be moderated by Julie Etchingham, will feature the leaders from the Conservatives, Labour, Lib Dems, SNP, UKIP, Greens and Plaid Cymru. The DUP in Northern Ireland have complained that they are not in there, but the fact that they aren’t actually competing against the other parties in Northern Ireland means that it is unlikely they will get anywhere with their protests. As for the debate themselves, each party leader will get about 11 minutes to speak and I really can’t see anything other than a load of carefully prepared soundbites thrown at each other as opposed to a natural debate. But this is the one Cameron agreed to do, possibly because the Greens and SNP will need to have a go at Labour more than him to actually win votes. Which makes the April 16th debate particularly interesting. That will be between all parties currently in opposition at Westminster, on the BBC moderated by David Dimbleby. So it won’t include Nick Clegg but it WILL include Miliband, who will find himself targeted as the only mainstream party leader by the other insurgents. Nigel Farage will find himself out on a limb, as the only right-leaning leader on the panel, but he won’t be bothered by that, as he and those who are intending to vote UKIP are attracted to feeling isolated and embattled. That debate will be a REAL test of Miliband, and I would imagine it will be the one he is most concerned about. Finally, on April 30th is a “special” version the BBC’s “Question Time” programme, in which David Dimbleby will host again and David Cameron, Ed Miliband and Nick Clegg will answer questions from a studio audience. This, along with the one on Thursday, will need to be carefully prepared, as every party will already have their letter of protest written about the bias of the questions asked by the audience. Again, I would suggest the person going last has a massive advantage, so it will be interesting to see how that works too. All in all, this really is a compromise, and David Cameron could be seen to have won. At some point, perhaps when his political career is finished, he will give an open and honest answer about his behaviour towards these debates over the last few months. This is someone who has barely held any open press conferences during his time in office, unlike his predecessors, and it is easy to see why opponents will say that he runs away from being held accountable. He did say in 2009 that he thought the having the debates would be good for democracy, but he is allowed to change his mind, having been through being in them and seen their weaknesses. Ultimately, it must have come down a simple calculation, being that he will lose less votes by shying away from the debates than he will if he takes a full part in them. I wonder if he is right?